Sundays 9.30am and 5pm (new time as of 3 March 2019) and everyone is welcome. We value our worship space as a sanctuary where we can learn more from God’s Word and be connected with Him and with each other, both young or old. Worship time usually lasts about an hour. The Evening Services are relaxed and informal. Once a month, we have a Café Church on St Paul’s, starting earlier with a light meal around 5pm. 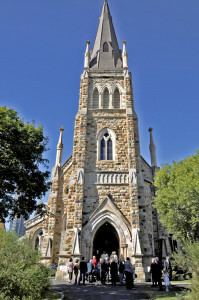 Special Services are held for Easter, Christmas, Anzac Day and Remembrance Day, Kirkin’ o’ the Tartan ( in Autumn) St Paul’s special anniversaries in May (dedication of the building on 5 May 1889) and August (anniversary of the formation of the congregation on 20 August 1863). We follow a traditional format for the morning and evening services with hymns, prayers, children’s segment (school holidays), Bible reading and a message. The message at these services helps us explore the Bible’s teachings and challenges us to model our lives on Jesus Christ and His ways. We have Bibles in the pews so that we can follow along as it is read aloud by one of our members. We sing a mix of traditional hymns and some newer songs for worship. The pipe organ accompanies us at the morning service and at night we have either the organ or mandolin. Music is one of God’s special gifts to individuals and our worship is sometimes enriched by musical contributions provided by our church choir or soloists. Our prayers are all encompassing – we praise God and give thanks for all His goodness, we pray for the needs of the world and for other people, those known to us as well as unknown, and we petition God for our own needs. On the first Sunday of March, June, September and December we celebrate The Lord’s Supper (Communion) and those present who love the Lord Jesus are invited to share in this. As regulars at St Paul’s, we make a monetary offering each week during worship or by direct deposit. This is our way of giving something back to God for all His provisions to us. If visitors wish to do the same we are grateful but on the other hand, they need feel no embarrassment or obligation if it is outside their means or desire to give. 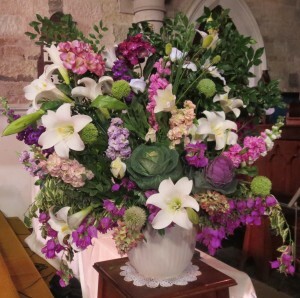 Members of the Flower Team beautify the sanctuary area each week with floral arrangements. Special floral tributes are sometimes arranged in response to a donor’s request in memory of loved ones.